What’s the best way to insulate a slab-on-grade foundation? 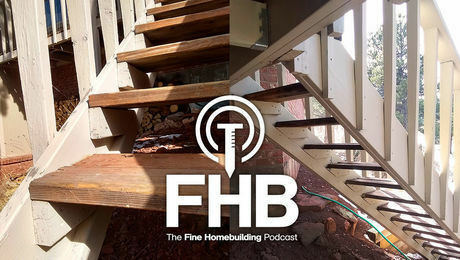 The answer depends on at least four factors: the climate, the type of foundation, whether the slab includes hydronic tubing for radiant heat, and the severity of the local termite problem. The most important factor is climate. In climate zones 1, 2, and 3, most builders don’t bother to install any insulation. While it could be argued that insulation might be useful in climate zone 3, it really isn’t needed in warmer climates, where an uninsulated slab helps lower air-conditioning bills compared to an insulated slab. 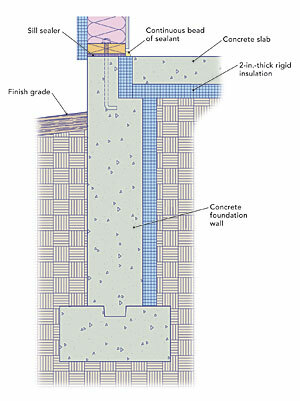 In climate zones 4 through 8, the most common locations for insulation are at the perimeter of the slab (installed vertically) and under the slab (installed horizontally). Less common is a third method: buried horizontal or sloped “wing” insulation installed around the exterior perimeter of the building to raise soil temperature. During the winter, when the temperature of the outdoor air is colder than the soil temperature, the coldest part of a slab on grade is always the perimeter. In cold climates, most slab-on-grade foundations include perimeter stemwalls (or frost walls) that extend 3 ft. or 4 ft. below grade. The area between the stemwalls is usually filled with compacted gravel to support the slab. 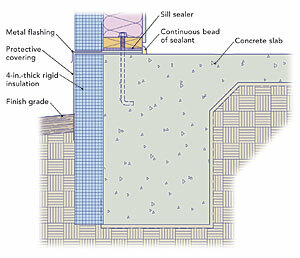 Because they are easier to insulate, slab foundations with stemwalls are preferable to monolithic slabs. At a minimum, this type of foundation requires vertical perimeter insulation to separate the slab from the stemwall. Most builders install 2 in. of XPS or EPS insulation at this location. Thicker insulation is better, of course, as long as the builder can come up with a detail that allows finish flooring to be installed easily near the exterior walls—a task that can be difficult if the foam insulation is exposed at this location. Many builders bevel the top of the vertical insulation so that none of the rigid foam is visible after the concrete slab is placed. 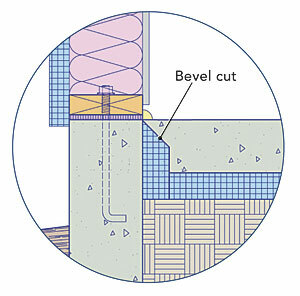 In cold climates (climate zones 4 and higher), it’s important to install vertical insulation on the interior side of the stemwall all the way down to the footing. In most climates, it’s important to install a 4-ft.-wide band of horizontal insulation at the perimeter of a slab on grade and to insulate the interior of stemwalls with a minimum of R-10 insulation. 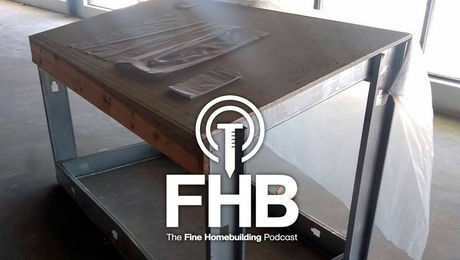 If the top of the vertical rigid foam installed at the slab perimeter is visible on the interior of the house, it can be hard to install flooring. The usual solution is to bevel the top of the foam so that concrete will then cover the bevel. In climate zones 4 and higher, it’s also a good idea to install some horizontal insulation under a slab on grade. If you want to save money, you can install a 4-ft.-wide band of horizontal R-10 (or higher) insulation at the perimeter of the slab in a picture-frame configuration. Builders with a bigger budget, especially those in cold climates, should consider installing continuous horizontal insulation under the entire slab. 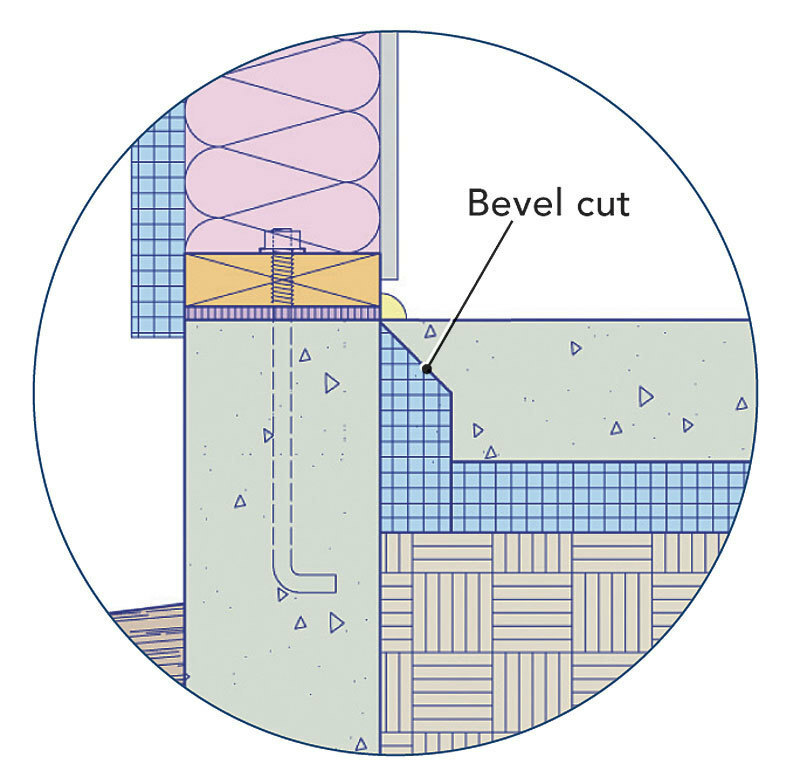 A continuous layer of horizontal insulation reduces heat loss in the winter, and it reduces condensation of humid air on the slab during the summer. Slabs that include embedded hydronic tubing for radiant heat always need a continuous layer of horizontal insulation under the entire slab. If your slab is heated, it’s a good idea to increase the R-value of the vertical and the horizontal insulation to at least R-20. Monolithic, or thickened-edge, slabs can only be insulated on the exterior. In climate zones 4 and 5, building codes require a minimum of R-10 vertical insulation that extends down 2 ft. In climate zones 6, 7, and 8, it must extend down 4 ft. The main disadvantage of exterior foundation insulation is that the above-grade portion needs to be protected from physical damage. Materials options include a cementitious coating (ideally, one with chopped fiberglass), cement backerboard, pressure-treated plywood, metal flashing, or a proprietary plastic or peel-and-stick covering (Protecto Bond). Unless you live in a very cold climate, you probably have to consider termites. Most experts advise builders to treat the ground under slabs and near foundations with an insecticide that includes fipronil (for example, Termidor) and to install a termite shield, set in mastic, under sill plates. 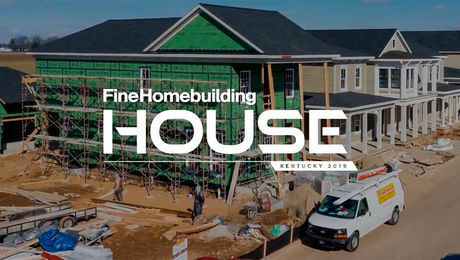 Requirements for protection vary widely from state to state, so consult your local building department to verify requirements before beginning construction. 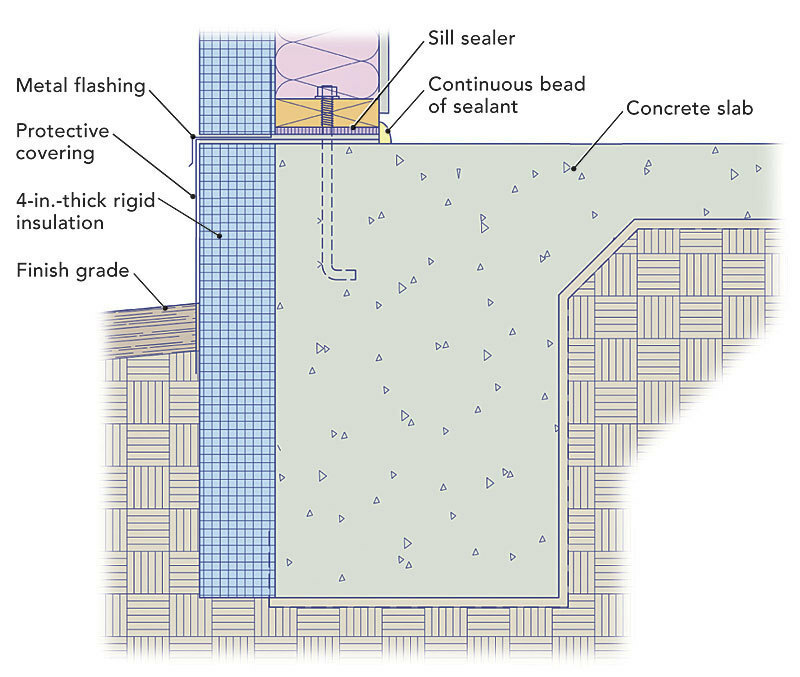 Insulation requirements for slab-on-grade floors can be found in section R402.2.9 of the 2012 IECC and section N1102.2.9 of the 2012 IRC. Both codes state, “Slab-edge insulation is not required in jurisdictions designated by the building official as having a very heavy termite infestation.” Otherwise, both codes require that “slab-on-grade floors with a floor surface less than 12 in. below grade” need vertical insulation at the slab perimeter. These codes do not require any insulation for slabs that are more than 12 in. below grade. The codes are silent about whether above-grade slabs need to be insulated. 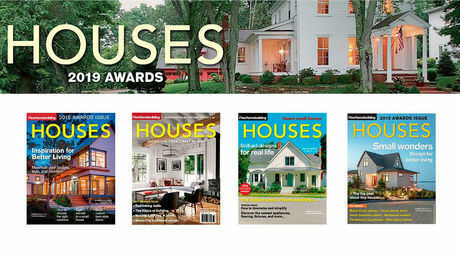 This omission is curious, since most slab-on-grade homes have above-grade slabs. Most inspectors, however, require above-grade slabs to be insulated in the same way as belowgrade slabs. In climate zones 1, 2, and 3, slabs are not required to be insulated unless they include hydronic tubing, in which case they are required to have R-5 vertical insulation extending downward from the top of the slab to the footing. In climate zones 4 and 5, the code requires certain slabs (below-grade slabs that are less than 12 in. below grade) to have R-10 vertical insulation at the slab perimeter, extending downward from the top of the slab to a depth of at least 2 ft. 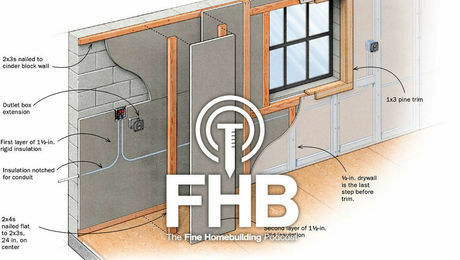 If the slab has hydronic tubing, the minimum R-value of this insulation increases to R-15. The same R-value requirements apply in climate zones 6, 7, and 8, but the insulation must extend to a depth of at least 4 ft.
What’s Better: Crawlspace or Slab-on-Grade? I am building a house in a cave near Moab, UT. The main floor has sandstone rock for grade. When my neighbors don't heat their homes, the interior temperature is around 65 degrees. I plan to do HE Pex in floor radiant water heat. My downstairs square footage is around 5,000 sq.ft. I am torn over whether to use Insul-Tarp under the slab. What do you think?